Quagga and Zebra mussels are harmful, highly invasive freshwater species recently discovered in California waters. California’s resources agencies have stated that the further spread of Quagga or Zebra mussels in California waters may result in an environmental and economic disaster. Learn more about the mussel invasion. Visit Quagga and Zebra Mussels Incident Description. Current infestations in California are limited to Quagga in several Southern California reservoirs that receive water from the Colorado River. There is one Zebra mussel infestation at an isolated reservoir in San Benito County. Access the map. 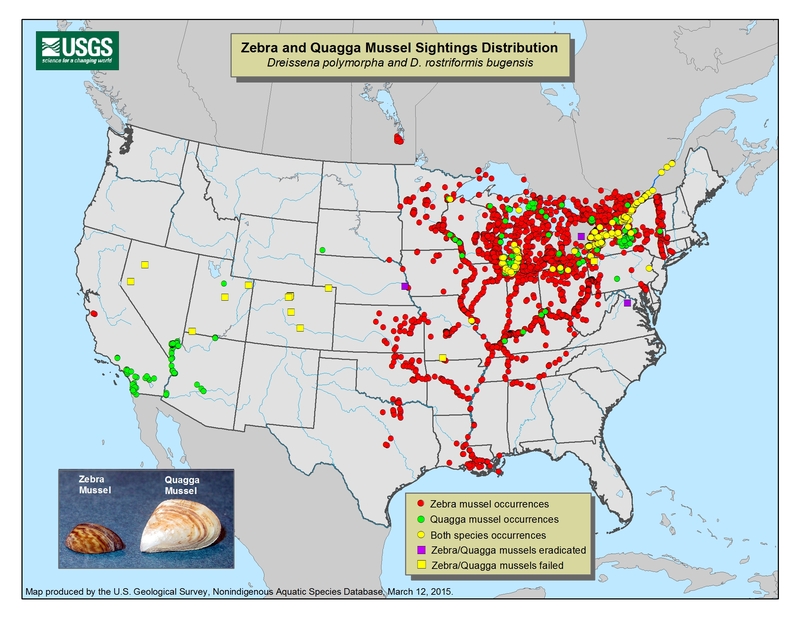 Visit Zebra and Quagga Mussel Sightings Distribution. The appearance of the mussels has heightened concern that they may infest other California waterways. Recent California legislation added a requirement to the California Fish and Game Code. Owners and managers of reservoirs must assess the vulnerability of their reservoirs for the introduction of nonnative dreissenid mussel species, such as Quagga and Zebra. They must develop and implement a program designed to prevent the introduction of these mussel species. Get more information about public recreational facilities. Visit Another benefit of Hydropower. Quagga and Zebra mussels can clog water pipes, coat piers and ruin boat motors. Transferring a boat from an infested body of water to another may spread the mussels. Boaters must check their boats, trailers and vehicles each time they take the boat out of a lake or reservoir. Inspect all exposed surfaces. Small mussels feel like sandpaper to the touch. Wash the hull of each watercraft thoroughly. Drain all water and dry all areas. Drain and dry the lower outboard unit. Clean and dry all live-wells. Empty and dry all buckets. Dispose of all bait in the trash. Allow the vessel to dry for five days in hot weather and up to 30 days when cool and moist. Keep watercraft dry between launches in different bodies of freshwater. Report sightings of Quagga and Zebra mussels by calling the California Department of Fish and Game Quagga and Zebra Mussel Hotline: 1-866-440-9530. Get more information about helping to prevent the invasion. Visit California Department of Fish and Wildlife Quagga and Zebra Mussels. We appreciate your vigilance and support to keep California’s waters free of invasive mussels.